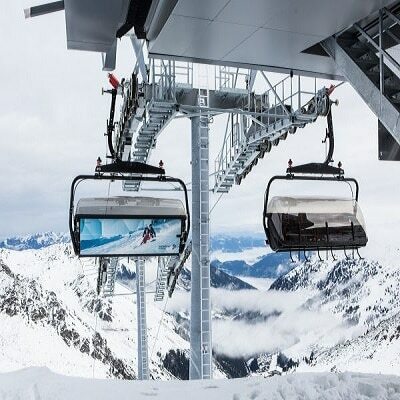 Step on board and launch into the next ropeway generation with Doppelmayr. The D-Line is a visionary ropeway technology with impressive features : top passenger comfort, quiet operation, simple and time-saving maintenance, and much more besides make the D-Line first class. The D-Line components and assemblies boast a brand new design; their enhanced functions open up new possibilities. Whether it’s the stations, detachable grips or sheave assemblies the D-Line impresses all along the line. The new cabin offers much more space and comfort; operation is even more reliable and even quieter. This series is available in 6 seats and 8 seats. The material used is characterized by its exceptional strength, which is why Starplast was chosen to provide the chairlift bubbles of the latter.